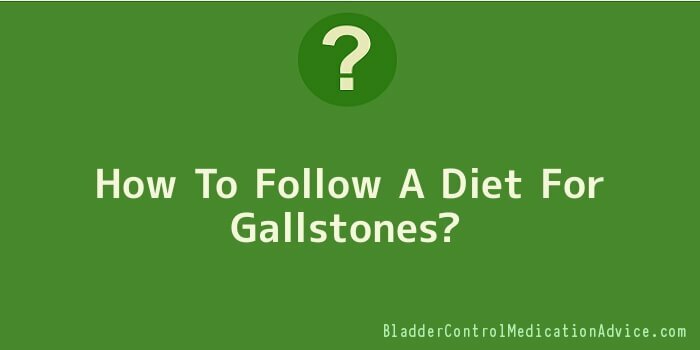 How To Follow A Diet For Gallstones? Gallstones occur in many people, and, only from time to time they cause painful attacks. Even so, the pains are so bad, that there is no wonder these individuals are constantly seeking a diet for gallstones able to prevent these attacks. The real cure for gallstones, if the problem becomes too much to bear, consists of gallbladder removal, but, until then, there is something you can do, meaning to follow some dietary recommendations. The main idea for a diet for gallstones is to eat less fat rich foods, which are the main cause for these attacks. When buying food from the supermarket, it may prove quite difficult to interpret the labels, as often you cannot tell where the fat contained is under 5%, as recommended for patients with gallstones. However, there are some things you can avoid to reduce the pains, especially if you are preparing yourself to undergo surgery, in order to remove the gallbladder. For instance, patients with gallstones are strongly advised to avoid foods such as butter, oil, fat meat, cheese, full fat milk, and nuts. All these foods contain a lot of fat, and, obviously, they are no good for your gallbladder. A good diet will include lean meat, like chicken, or white fish, as these are low in fat, and they do not pose a problem for your gallstones. If you want to dress your paste with a tasty sauce, always go for the light versions, which do not contain too much fat. As long as they are tasty, this should not be a major bother, especially since many people get the wrong idea that all diet foods must be tasteless. As long as staple food is concerned, potatoes, rice and pasta are all allowed, so following a diet for gallstones will not leave you famished. On the other hand, you may end up enjoying some great side effects, like losing a little weight, since you are eating a low fat diet. Desserts are not excluded, either, and you can enjoy some yoghurt, fruit smoothest and no fat muffins. Of course, you will need to pay attention to all labels, and, when you are having dinner in a restaurant, do not hesitate to ask to be served dishes that are low in fat, so you do not ruin your evening by rushing to the emergency room, in pain. On the other hand, specialists advise against a totally fat free diet. The truth is that lack of fats can cause gallbladder disease, as well, so it is not a good idea to take out all the fat from your diet. What you can do is to replace wrong fats with good fats, and, among the latter, omega 3 oils are considered to be both tasty and healthy for your body. Flax oil and hemp oil are part of this category, so adding some of them in your diet will only do you good. Carrying on with a diet for gallstones can prove to be beneficial for many points of view. While it cannot cure your gallbladder problems, it can make your situation bearable, which is not to be taken lightly.